Carlisle’s fish-friendly AquaTough rubber pond liners are specifically designed to resist the growth of microbes and algae, as well as harsh weather conditions such as frost, snow and extreme temperatures. With enhanced weatherization and increased resistance to ozone and UV exposure. 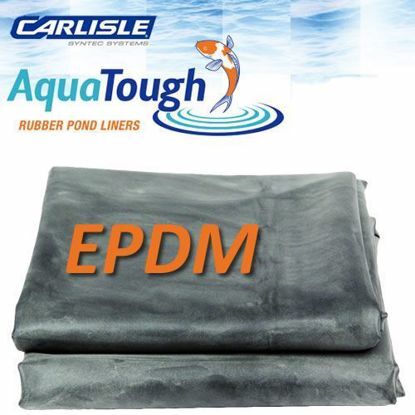 Carlisle 10' wide fish-friendly AquaTough rubber pond liners are specifically designed to resist the growth of microbes and algae, as well as harsh weather conditions such as frost, snow and extreme temperatures. With enhanced weatherization and increased resistance to ozone and UV exposure. Carlisle 15' wide fish-friendly AquaTough rubber pond liners are specifically designed to resist the growth of microbes and algae, as well as harsh weather conditions such as frost, snow and extreme temperatures. With enhanced weatherization and increased resistance to ozone and UV exposure. Carlisle 20' wide fish-friendly AquaTough rubber pond liners are specifically designed to resist the growth of microbes and algae, as well as harsh weather conditions such as frost, snow and extreme temperatures. With enhanced weatherization and increased resistance to ozone and UV exposure. Carlisle 25' wide fish-friendly AquaTough rubber pond liners are specifically designed to resist the growth of microbes and algae, as well as harsh weather conditions such as frost, snow and extreme temperatures. With enhanced weatherization and increased resistance to ozone and UV exposure. Cover Tape provides a bond to seam 2 panels of EPDM liner together. Can be used with 3" seam tape to create a EPDM to EPDM waterproof cure. Works best with an EPDM primer to insure a clean and permanent bond.